In a bowl, combine the chicken breasts with garlic, salt and pepper. Wrap the chicken in clingfilm and flatten them with a rolling pin. Place onto each chicken breast half a slice of ham, a slice of emmental cheese, the other half of the piece of ham, and another slice of emmental cheese Roll the chicken breasts up and tighten the clingfilm to make 4 sausages. Cut the pastry sheets in 2, spread the mustard over the top and place a chicken roll on each. Fold the pastry over the chicken and seal the edges by pressing the pastry together with your fingers. 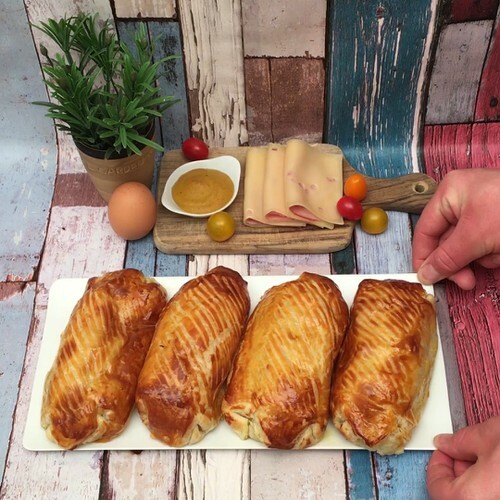 Arrange the wellingtons on a baking tray lined with baking paper, and brush them with egg yolks. Then use a fork to draw lines on the top of the pastry. Bake for 18 minutes at 180°C and enjoy hot.